As evident in my recent casual athleticism post with Dan, I’m clearly digging the fashionable sneaker trend! It took me a little bit longer to get used to the idea of wearing ‘athletic’ shoes with ready-to-wear, but now that I’ve accepted it, I’m obsessed. It doesn’t get much better then wearing comfortable shoes, while rocking a cute look. 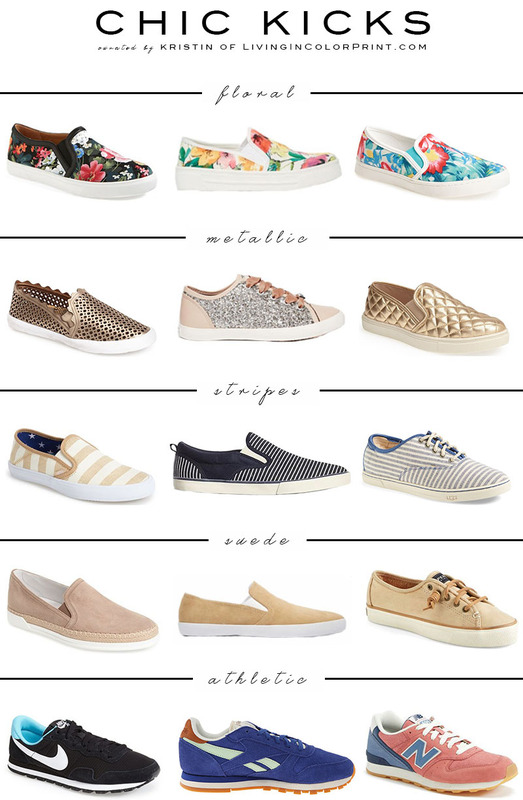 What’s YOUR fave pair of chic kicks? I love how sneakers are getting so fashion forward! I need some floral kicks for sure! Great roundup! Um, I’ll take all of these in my closet, ASAP! Those sparkly metallic sneakers are perfect! how much fun are floral kicks, I am in love with them!! Great picks! I’ll take them all, please! Love wearing sneakers with everything from skirts to jeans!